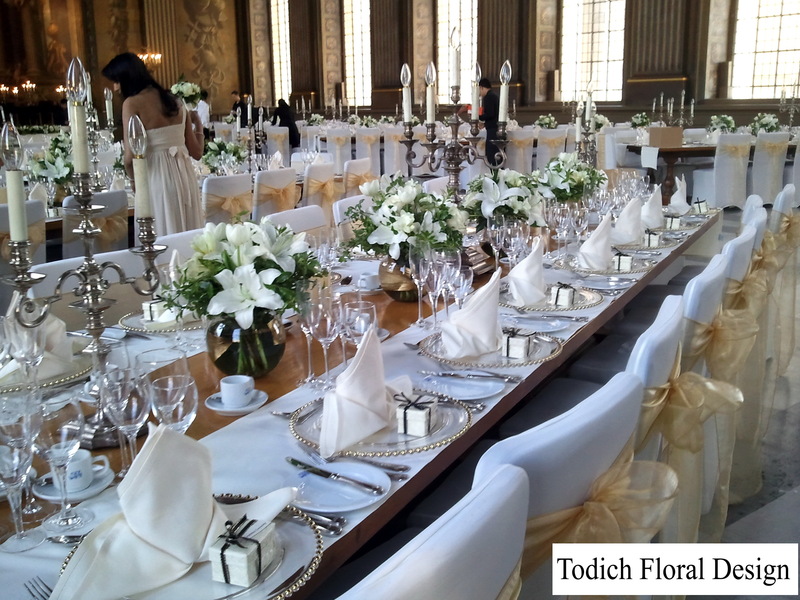 Todich Floral Design always enjoys getting involved in local wedding shows; the Autumn Wedding show at London Earls Court is a prestigious event which brings all the companies in the industry together to offer the best services for the happy couple’s special wedding day. 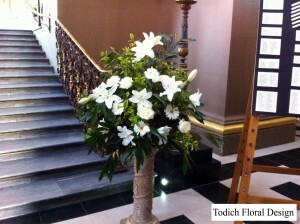 Every year we prepare our stand to show the most beautiful, creative and unique designs that our florists can offer. 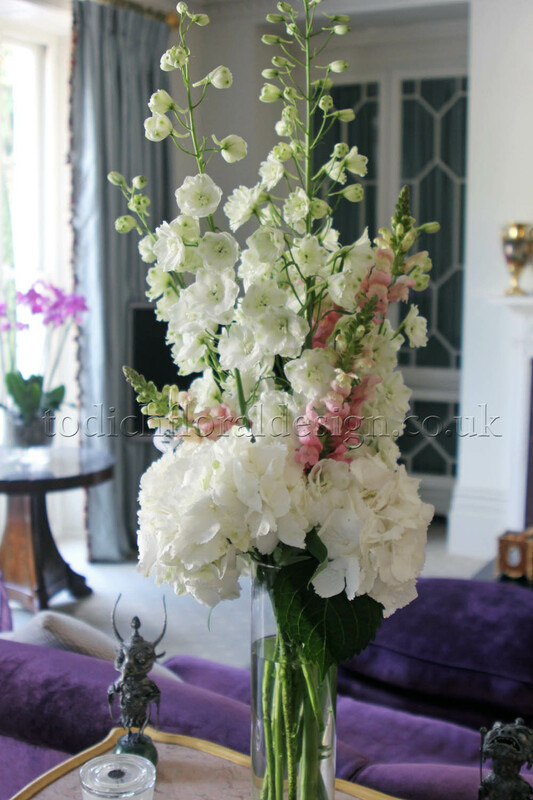 One of our designs was so inspiring that it caught the eye of a bride who immediately contacted us to arrange and design her flowers for her own wedding in May 2012. 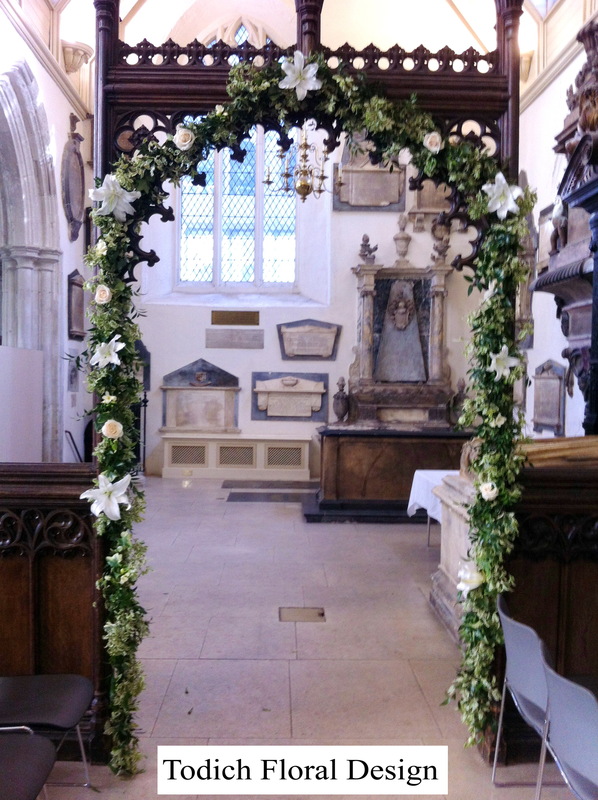 The bride was getting married at St Helens church, London, the church was where she grew up and is full of fond childhood memories; the bride believed that this would be the perfect venue for her wedding day. 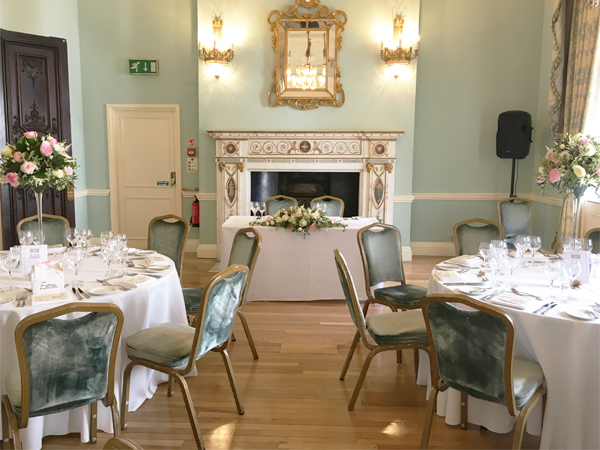 We sent our head consultant over to ‘The Painted Hall’ to view the lighting, décor and colours to ensure that our flower designs will match the interiors and theme of the wedding perfectly. 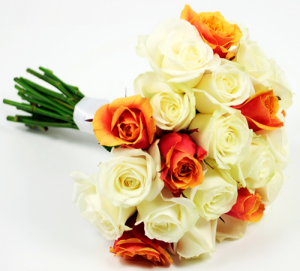 With a wedding held in the middle of spring; there are plenty of beautiful seasonal flowers for the bride and groom to choose from. The brides favourite flowers were roses and the groom loved tulips, both wished that these flowers were to be incorporated into the floral arrangements. We believe that the bridal bouquet is one of the beautiful accessories to a brides wedding day, her stunning bouquet tied in all the colours, shades and themes of the wedding into one beautiful arrangement. 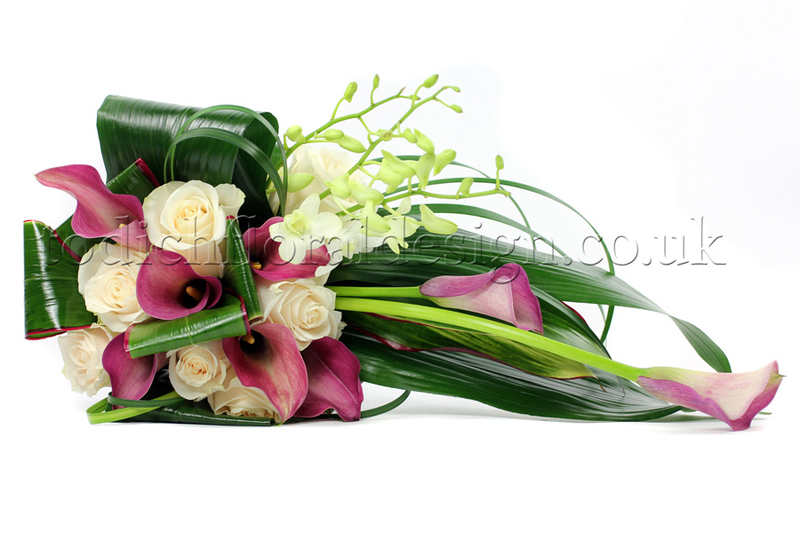 Her bouquet a trailing design of fresh cream calla lilies, champagne coloured roses and cream dendrobium orchids; the design was then finished with complementary foliage and a silk ribbon. 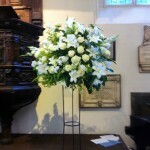 The Church pedestal was an eye-catching and beautiful design that stood at the alter during the ceremony. 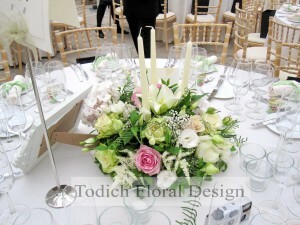 The design included a selection of cream and champagne flowers that were mixed together with spring foliage. 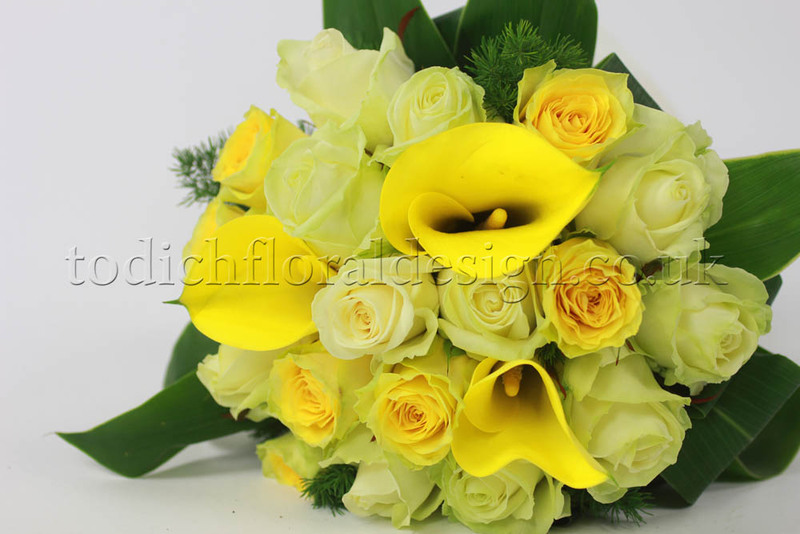 The lilies fragranced the room with a beautiful scent and the cheery gerberas looked striking in the arrangement. 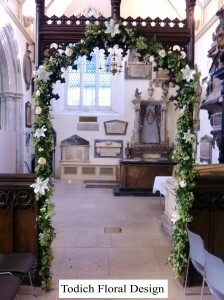 then stylistically tied against the arch and looked exquisite in the chapel. ‘The Painted Room’ colours consist of neutral tones with a hint of gold and bronze. 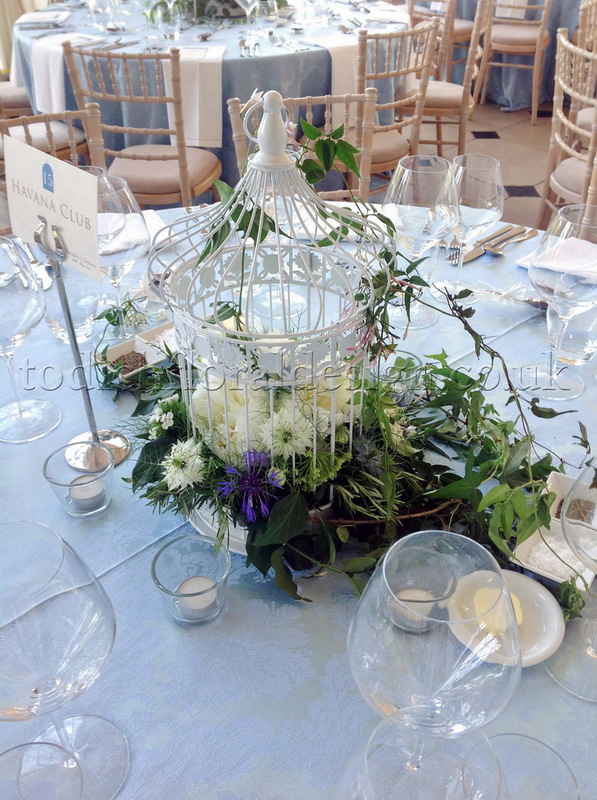 The Table arrangements were created in classic fishbowl vases and included gold sprayed aspidistra leaves which lined the inside of the vases. 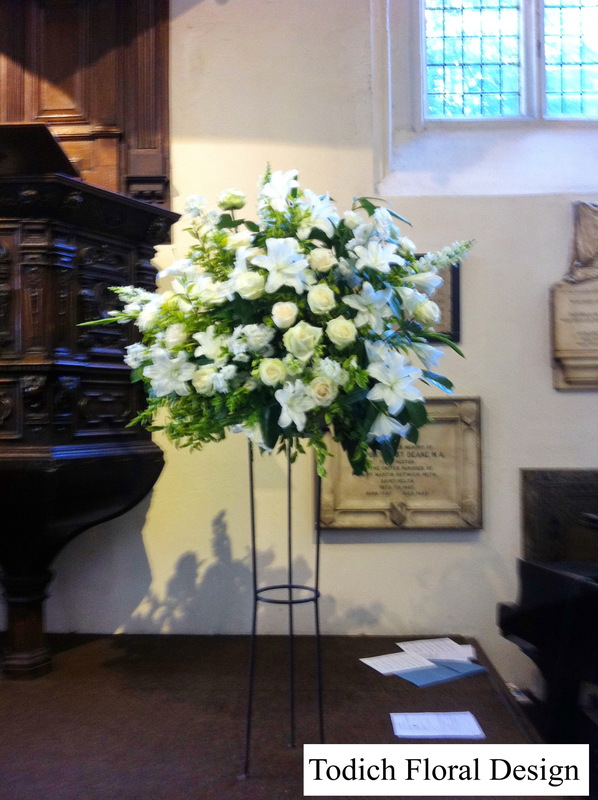 White tulips, Roses and lilies were included in the designs and were arranged together amongst spring foliage. 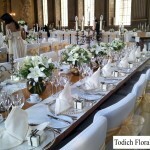 All 60 table centres were then evenly placed onto the tables to match the cream and gold coloured table cloths. 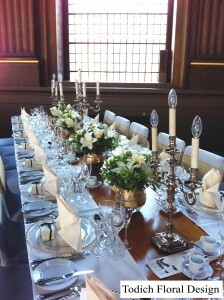 The designs were classic and simple yet chic, the gold décor made the arrangements stand out in the venues. The mix of champagne and cream flowers worked beautifully together and the flowers not only filled the room with beauty but fragranced it with a wonderful spring scent. Wedding Season is one of the busiest times for a florist, with the season lasting from March to September; we are already in full swing with our 2012 weddings. 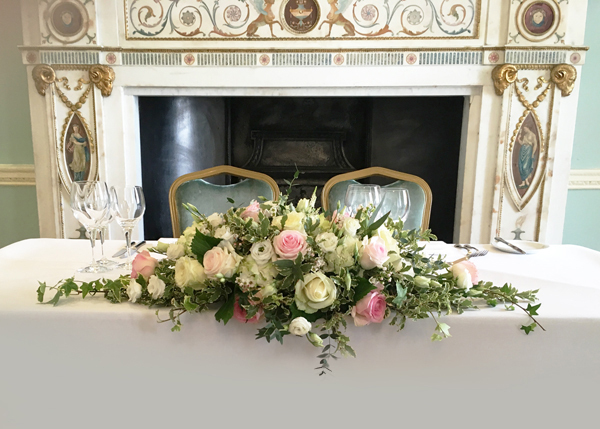 May is one of the most popular months to get married, with the best seasonal flowers in full bloom and the mild spring temperatures it is the perfect time of year for a British wedding. 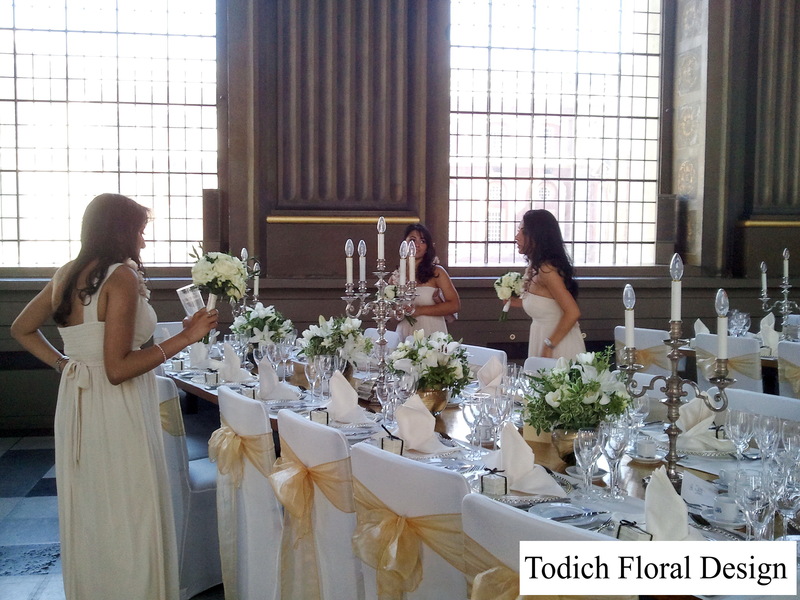 Our consultants were approached by a bride and groom who were looking to get married on May 5th 2012 and we were happy to assist. The wedding was held at the popular venue Syon House in Brentford, Middlesex, The ceremony at Syon house is held in a magnificent hall and the reception is held at ‘The Great Conservatory’, An impressive windowed building that looks onto beautiful gardens, The Conservatory is perfect for spring wedding because of the well maintained floral grounds, the windows let in lots of natural light and is perfect for photo opportunities. 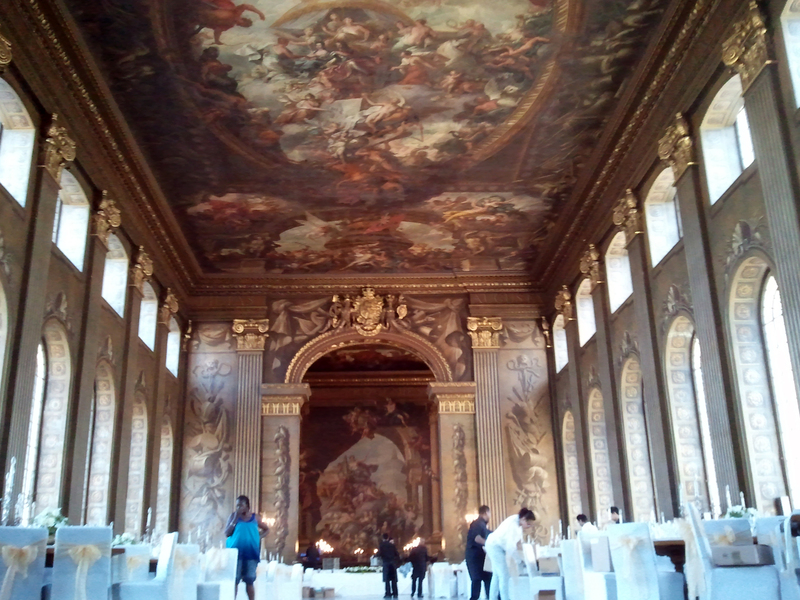 Syon House is a truly stunning venue and we were thrilled to be asked to design the flowers for such a wonderful place. 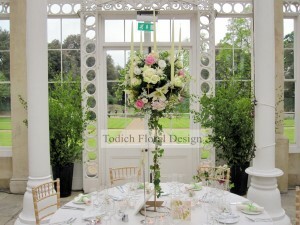 The brides colour schemes were of pretty pastel pinks , mint green and creams, She asked for these colours to be interpreted into her floral arrangements, ‘Natural’, and ‘Spring Garden’ were the key words for this wedding and thankfully she has chosen the perfect time of year for her favourite flowers. 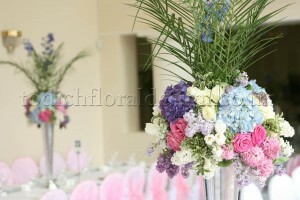 During a consultation they discussed that over 100 guests were being invited and that they were having over 10 tables, after showing the happy couple our tall and low table arrangements they couldn’t resist but choosing both styles for their wedding, With the mix of displays we decided to keep the designs alike with matching the same colours and flowers, The tall arrangements stood tall at the centre of the tables, lined with cascading ivy, the breath taking vibrant waterfall of pastel coloured flowers looked elegant with the glossy ivy and falling foliage. The small table arrangements were mixed with subtle spring flowers and finished with large cream candles inserted into the centres, the floral arrangement were then surrounded by delicate crystal tea lights. 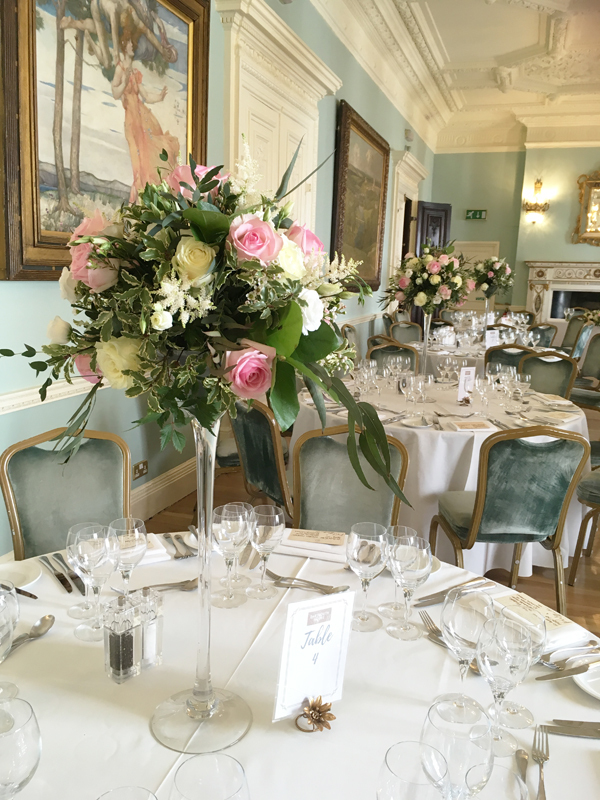 We made sure all aspects of the flower designs matched with the wedding, even down to the corsages and buttonholes, delicate pale pink roses were tied together with small sprigs of ivy and finished with luxury satin ribbon. 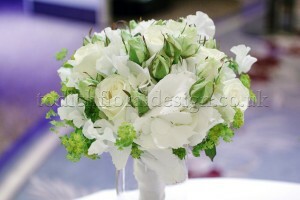 The bride didn’t have bridesmaids due to her traditional heritage, so instead we made the bridal bouquet extra spectacular, a lovely arrangement of pastel coloured roses, liianthus, astilbe and gypsophilia were mixed together into the arrangement, we then finished the bouquet with a luxurious cream satin ribbon and a frame of ivy. 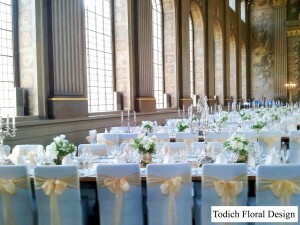 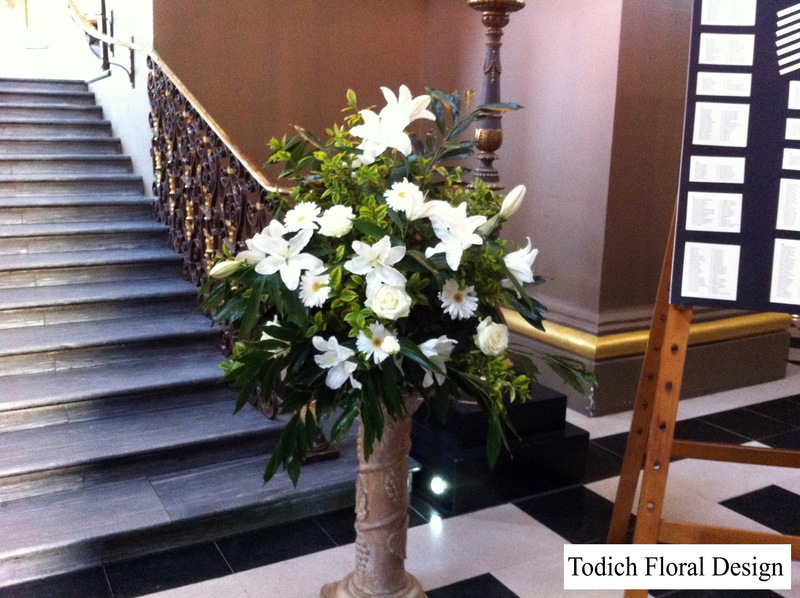 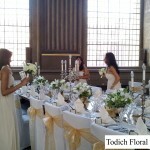 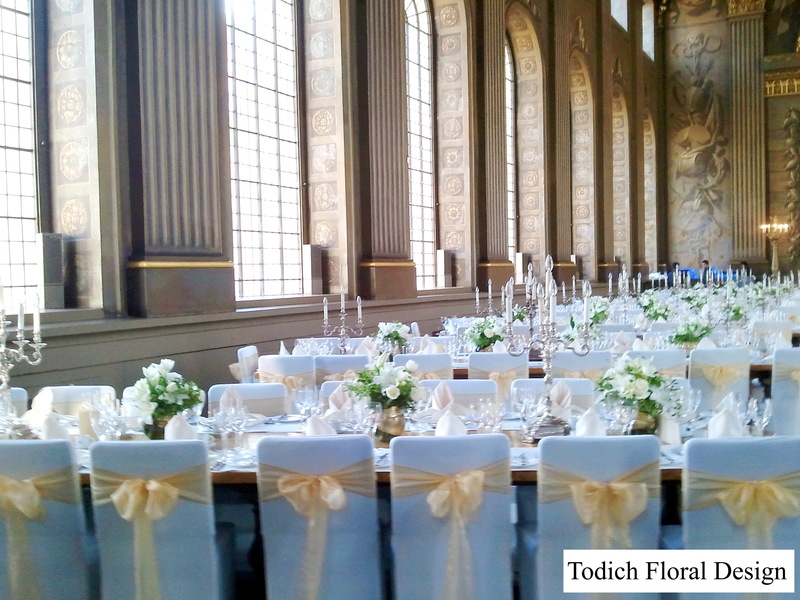 We at Todich floral design will always go that little bit further to make a brides wedding day perfect. 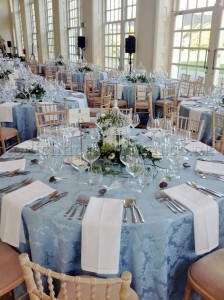 We do not only design flower arrangements, we also can cater to help the brides with any other stationary & gift requests, This particular bride asked us to provide fabric napkins and individually wrap them in mint green silk ribbons, Each one we individually tied and finished with a bow and they matched perfectly with the flowers and looked stunning on the tables. 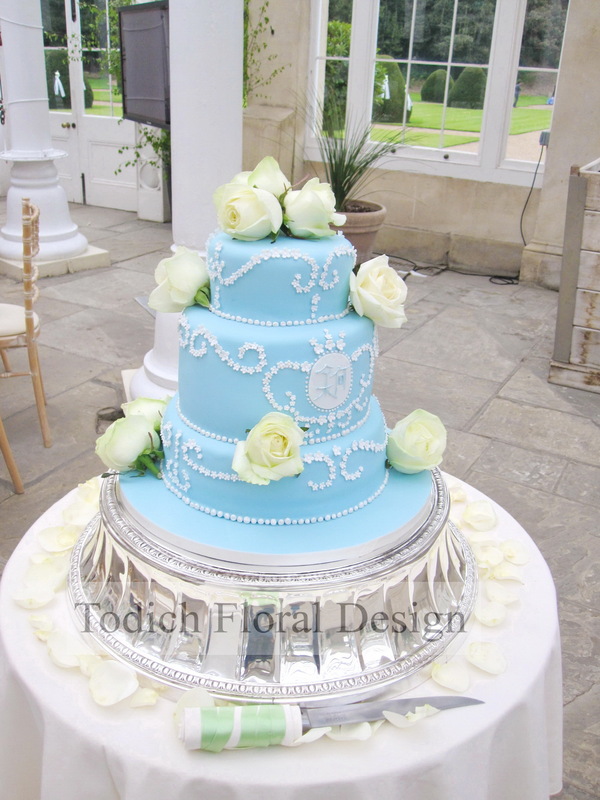 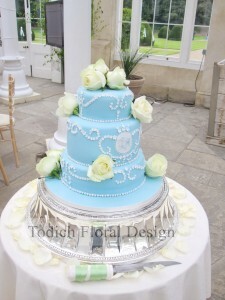 The couple were of Hong Kong/ Chinese descent and they had their cake designed in a shade of baby blue with an added Chinese symbol placed onto the front, For the cake we wanted to keep the flower designs as simple as possible, we placed single avalanche rose heads onto the top of the cake and surrounded the table with cream rose petals for added elegance and beauty. 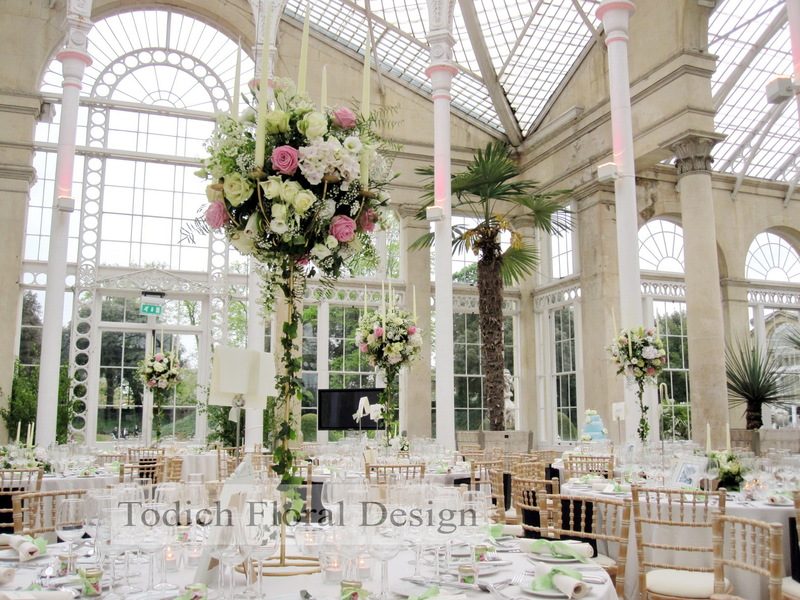 Overall the venue looked stunning, the flowers filled the room with a heavenly scent and looked truly beautiful, the flowers tones blended with the scenery and we are pleased that the couple were very happy with the designs.